Thought it had been cured by now? Still no known cause. Still no cure. Still quickly fatal. Still outrageous. I learned a big lesson at a grade school attended by families of modest means and run by women who lived on a vow of poverty. Whenever anybody made a good suggestion that was beyond the resources of the school, those Sisters of Saint Francis always said, "We can't do that, but this is what it would take..." And you learned the dollars or the added staff or volunteer commitment needed to deliver on that good suggestion. It showed respect that they actually considered the idea. The ball was back in the suggester's court, and you would be amazed at how often those with the ideas delivered the resources to make them happen. In the world of ALS organizations, we get a lot of, "We can't do that." Resources are limited. Staff feels that workloads are at the max. "We can't do that." Plop. We need more, "...and this is what it would take..."
Please, take good ideas seriously. Embrace good changes that stretch your comfort zone. Be direct and honest if you think an idea is bad or outside your mission. Don't blame your bank account or workload without offering some idea of what it would take to deliver. Walking away from good ideas is one of the reasons the fight against ALS isn't where it needs to be. That is what we can't afford. It's pretty basic. You can't make good decisions without good data. 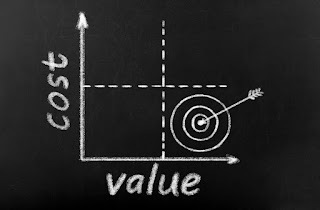 And a core decision in moving ahead with any project is to weigh the value proposition. 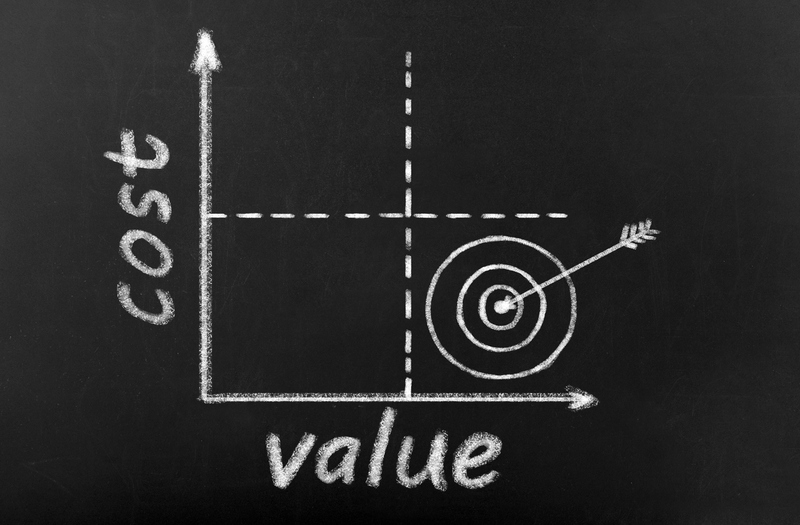 You clearly can't evaluate the cost and value without knowing the costs. A few months ago I started thinking about how we might look at the value proposition of the many functions of the CDC ALS Registry so that we could perhaps identify the high value, low cost features (that are obvious keepers) versus the low value, high cost functions (that might be good candidates to pare back). As a taxpayer and ALS advocate, I take the value proposition and the importance of the CDC ALS Registry mission seriously. But that doesn't really break out the granted research dollars for a year. It glumps a lot of functions together. I asked again, and he shared that the average research grant is $400,000. That's not really helpful to try to look at a normalized year of expense data. I asked again if the last annual spending on external research grants was easy to provide, and I was referred to the Freedom of Information Act (FOIA) office. My reply came last week, and I was astonished. They don't have the data. The National Center for Environmental Health / Agency for Toxic Substances and Disease Registry (NCEH/ATSDR) performed a search for records, as indicated above. 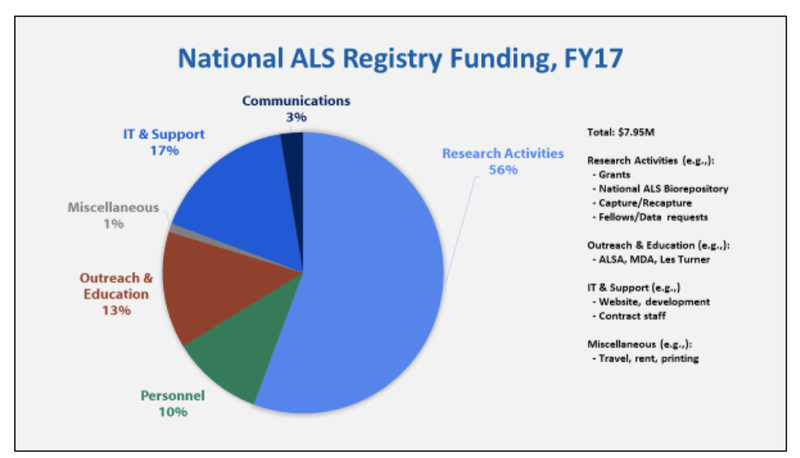 In their response, the National ALS Registry appreciates your inquiry regarding its FY 2017 budgetary activities. 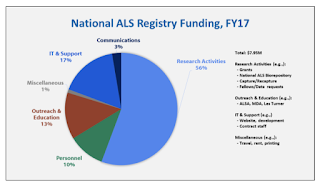 As was previously conveyed to you by email on January 23, 2019 from Dr. Kevin Horton—National ALS Registry Program Manager—the average grant for FY 2017 was approximately $400K/year per institution based on a 3 year cycle (Sept 2016 – Sept 2018). Regarding the subsequent, listed program expenditures, there is no direct way to accurately access costs for these specific activities (e.g., data mining, MMWR reports, and research notification) as they are largely elements of daily staff/program duties. The FY 2017 funding pie chart included in your request, represents the most accurate information available. 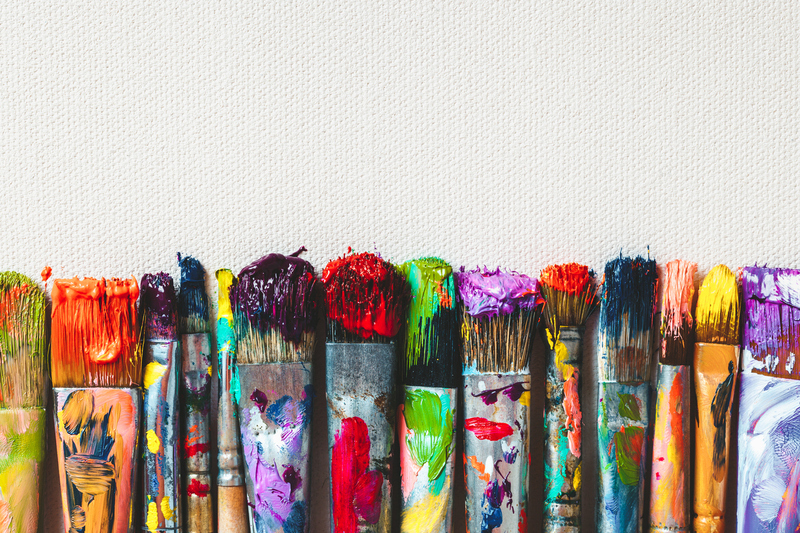 How can you manage a $10,000,000 annual budget on a project that has consumed $88,000,000 without knowing approximately how much was consumed by each function in your last year of actual data? How can you decide priorities when you don't know the relative costs of functions? How can you make good decisions? During the Vietnam War and after, POW bracelets were a powerful connection that people made with the many missing and prisoners of war. Each bracelet carried a name. Those who wore them remembered their POWs constantly. 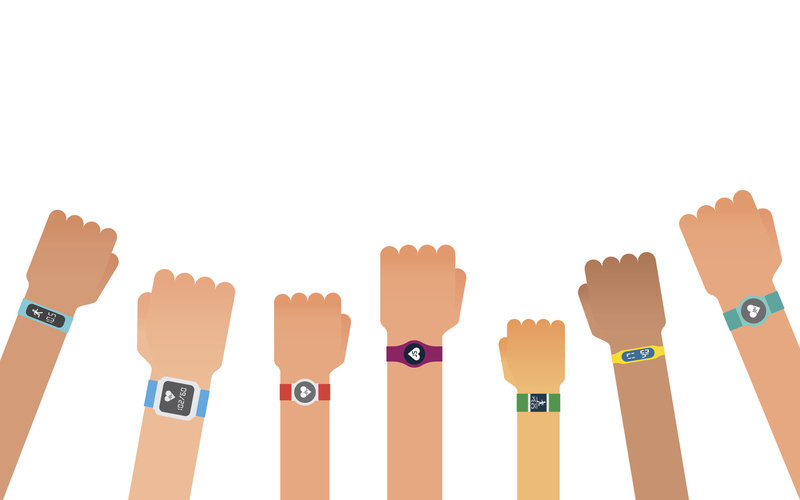 Bonds grew between people who never actually met in person and those bracelets stayed on wrists for years. It was a powerful project. wear. 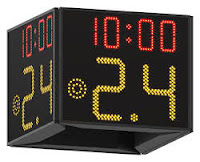 In today's world, we could even have some trackers where you could see your person's ALS Functional Rating Scale. And when a person on a bracelet dies, we could issue a new one. Pretty soon people would have a collection on their arms. 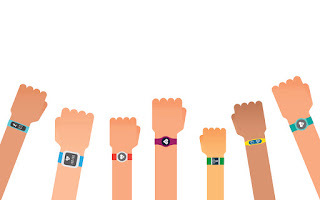 Imagine the power that would be added meetings with legislators or bureaucrats or captains of industry or journalists or healthcare professionals when you issue their PALS bracelets. Here's Mary Doe. She has ALS and is 42 and has three kids and is a single mom. Think of her often. Here's Joe Doakes. He's 35 and just got a big promotion and loves his job as an engineer. He and his wife have a new baby. Think of him often. Here's Jane Doanes. She's 70 and takes care of her husband with cancer. Now she has ALS. Think of her often. The other day I heard a radio feature for people looking for jobs. They advised to check twitter because many corporate HR organizations post jobs on twitter first. It proves to be cheap, easy, and effective for them to find good candidates. So why do we continue to try to fill clinical trials the expensive, hard, ineffective ways? What if every ALS trial sponsor knew to tweet information about their open trials seeking participants? Think something simple like, "The vitameatavegamin trial for ALS is still enrolling in Cleveland and Fargo. For more information see clinicaltrials.gov." Maybe have an easy hashtag like #ALSCT . Then the minute our major ALS organizations see the tweet, they would RT. Four major ALS organizations can reach over 50,000 followers with one simple RT. Pow. And followers would RT. This is the largest scientific symposium on ALS in the world. 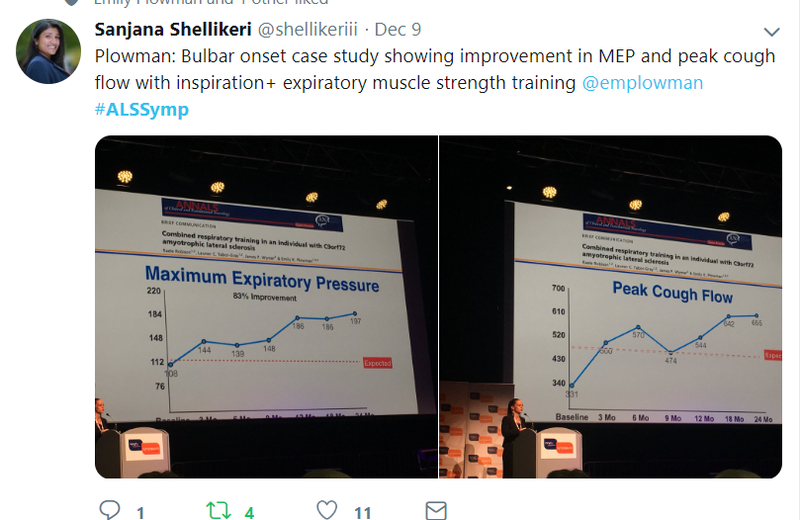 I have been grateful to have been a part of a small program (that needs to be a big program) that helps to include patients among the symposium attendees. They deserve a chance to hear the science. They deserve to be part of the conversation. This year there were three Patient Fellows chosen through a blinded, competitive process. Their fellowships included the conference registration fees and modest lodging and some pretty cool bags. The scientific symposium runs from Friday through Sunday. In the week leading up to Friday, there is a melange of various meetings related to ALS that are not part of the symposium itself. 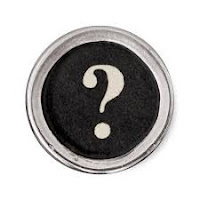 One of those meetings is the "Ask the" session that I blogged about earlier this week. 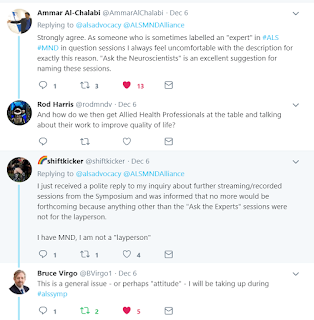 The reason that I chafe at the word experts in that context is exactly why I believe we need more people with ALS at the symposium. They are experts in ALS and know the outcomes that matter to them. 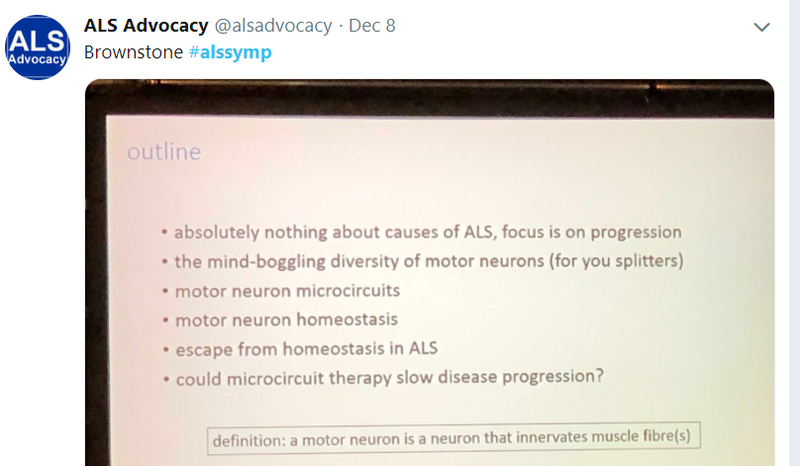 The symposium is not webcast for people with ALS who cannot travel; therefore, I tweeted pretty constantly with frequent pictures of Powerpoint slides under the hashtag #alssymp . After the welcomes, Dr. Mitsumoto kicked off with information on the Airlie House Guidelines which will finally be published in early 2019. 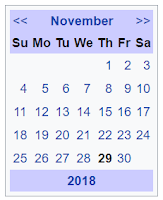 Boy, it seems like they have taken a long time. He spoke mostly of process and not much of the specific content. Princess Anne was an honored speaker, and I was honestly impressed. She gave a good talk and wasn't just reading pages. She also stayed to present some of the prizes that the symposium gives annually. Later she met with the local Scottish MND group and one of our Patient Fellows and his wife (from Edinburgh) were included. They both spoke higly of the her genuine interest and commitment to the cause. Dr. Cryan gave a fascinating general talk about the microbiome and the nervous system (although without any specific references to ALS MND). It was educational and I was amazed at the promoted tweets that I received after tweeting some of his information. McDonalds needs to talk to its social media ad agency. There was a pseudo-debate on how we define ALS. It was interesting and more entertaining than a straight lecture. 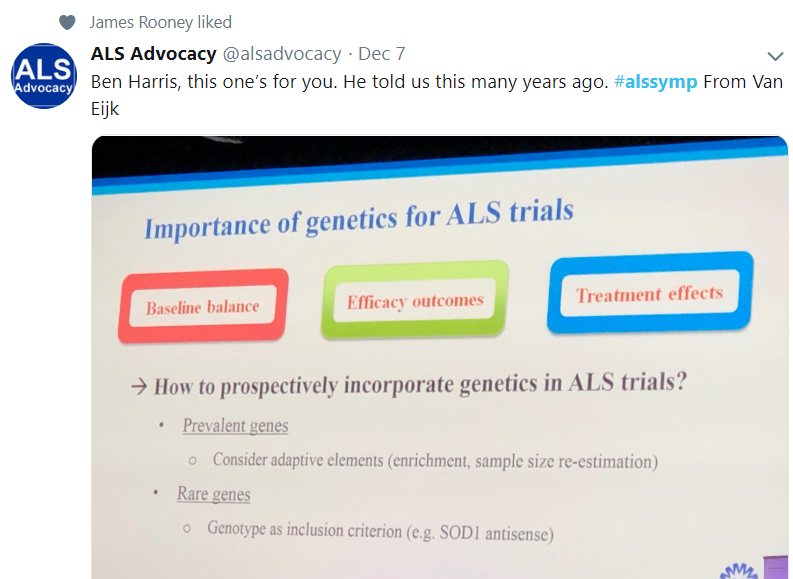 It established what we would hear as a continuing theme of ALS not being one disease and how clinical trial designs would have to be very different in the future. Almost all of the panelists and speakers spoke to the need for biomarkers (as we have heard for 20 years). The idea of which biomarkers and what they are to show is making that discussion more specific. Shaw presented on genes (a significant theme throughout the symposium). In one presentation, Dr. Hardiman mentioned that they don't see SOD1 in Ireland. Another person told me that they don't have C9 ALS in Korea. This certainly presents a challenge when we want an approval in one country to expedite an approval in another, and I'm very curious as to how genetics between Japan and US compare (thinking about edaravone). During one session, a researcher suggested that trial sponsors be required to run the full genome on trial participants so that better subgroup analyses could be performed. The symposium broke off from general sessions to tracks in the afternoon. Throughout the researcher's presentations, we still see scant thanks to people with ALS and caregivers on their acknowledgement slides. I think some realized that they might be called out on social media for the omission, so we sometimes heard "of course, patients" slipped in at the end like "word peace." This is not a superficial issue to me. When they thank funders and colleagues and not the people who put up their lives and time to make their research happen, we've lost our way. There was a session on decision support tools used in Australia that I missed that I wish I had seen. Parmar spoke to trial designs in cancer Ph 3 trials (platform, basket, multi-arm, umbrella, etc) and how they can literally save time and money. One of the ALS neuroscientists gave the standard obj3ection, "but you can measure the tumor in cancer." Parmar really dismissed that and said that he doesn't see ALS trial design as something that much different than cancer. He gave specific examples of trials that was most helpful in understanding the tangible difference that innovative trials can make. VanEijk gave a fascinating study on the problems of genetic imbalance in ALS trials. This is what a friend with ALS was trying to tell them years ago. If the placebo group differs genetically from the treatment group, does that mess up your trial? If you don't have the right genetic mix in your trial, will your therapy go plop? Brooks showed ibudilast results and mentioned muscle declines in the washout period. Do ethicists ever look at washout periods? Miller presented results from the last NP001 trial and had a deer-in-headlights look when he got questions. This was another one of those overachieving placebo groups and the anticipated responders just couldn't keep up with those placebo folks. The company will not be living on and this one is finished. This is the therapy that was described in the book, Personal Trials by Jef Akst. I believe that any ALS trial designer needs to read it. Cytokinetics sponsored an early morning session with another pseudo-debate on whether trial inclusion criteria should be broad or narrow. Interesting discussion. During the Q and A a Patient Fellow said that she didn't think she should have to choose between either NIV and a clinical trial. She eloquently brought out that we have standard-of-care issues in ALS trials. This is exactly why we should have more people with ALS and caregivers at the scientific symposium. We should not assume that just because there is no family history that a person with ALS does not have one of the known familial ALS genes. Your inclusion criteria pick the placebo group as well as the treatment group. Include/exclude wisely. 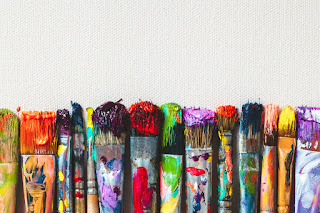 By the end of the session it was clear that very specific inclusions that will permit a therapy to show if it works are desirable with some broad access programs that can also contribute information to the understanding of the therapy. I got a comment in that I think that every inclusion/exclusion criterion should have the scientific rational included. In the past they have seemed arbitrary and perhaps not well thought out. People will be more enthusiastic about trials if they understand why. On to the track sessions, and Van Eijk gave a presentation on selection bias in ALS trials. I wondered if the inclusion criteria themselves might not contribute to that, too. Chio presented on gender differences in ALS. Shefner spoke to self-reported measures and how to make trials less burdensome to participants. He showed how some automated speech monitoring can be much more informative that the old ALSFRS-R. I wish we would stop talking and just do some of these things. I missed the session on Speak Unique and maintaining spoken identity, but there was definitely a lot of buzz about the concept and the various concepts available now. More followed on PROMS (patient reported outcome measures) and telehealth. I switched over to a track digging deep into the genetics. 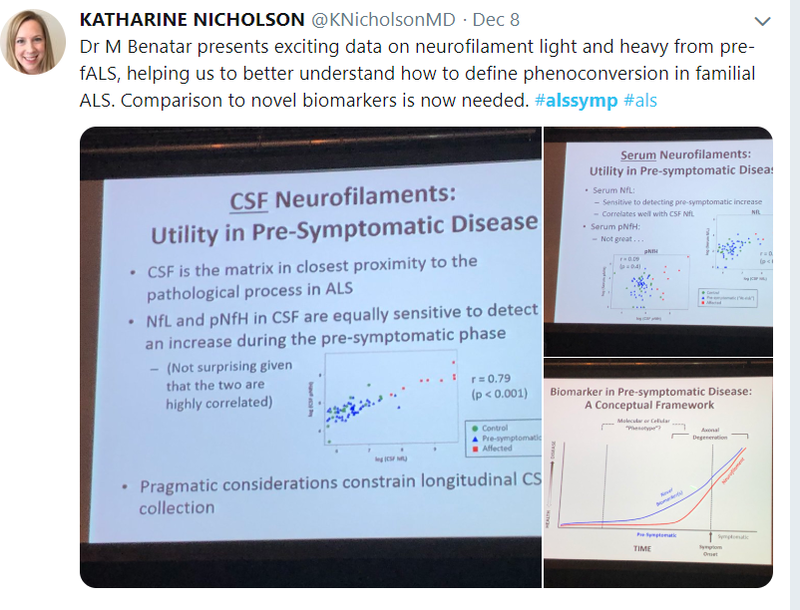 At this point I was not in the room where Dr. Benetar gave the presentation that got the most overall buzz at the symposium -- hope for a presymptomatic biomarker. In other presentations there were messages of needing to find the problem sooner than later in order to make treatments work. Alzheimer's was cited several times as a disease where much of the damage has started before it is recognized. Brownstone gave a wonderful presentation on how motor neurons actually work (or don't work) in ALS progression. I also saw a presentation on the MUNIX method for estimating the number of functioning motor neurons. There was a session on old people (80+ years) with ALS and how the disease and management differ from younger people. 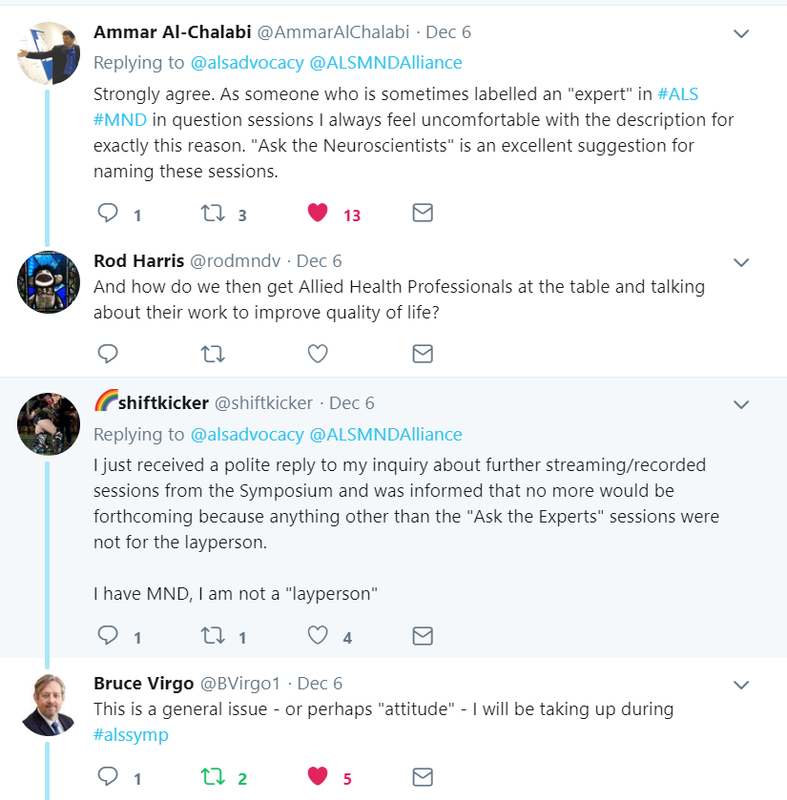 This was a session where they could have used some old people with ALS to address their experiences rather than having researchers speculate on why they differ. There were presentations on metabolism. What we used to call Ben and Jerry's Therapy seems to be in order. Thakore presented a controversial study on gastric tube placement and a lack of efficacy. 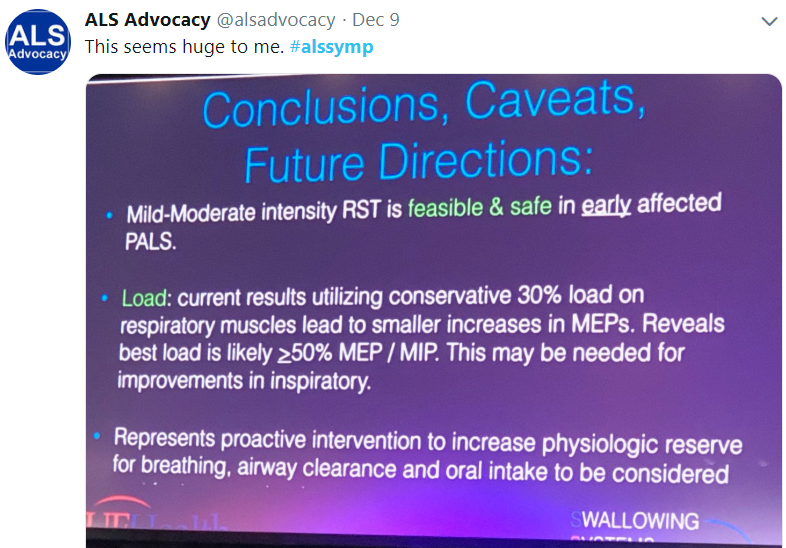 Jackson gave a presentation on the importance of NIV and the frustration that so many people with ALS are not "compliant." That's a loaded word. If you try something with a mask that bugs you and makes you feel worse, they call you "noncompliant." Blame the patient rather than the intervention. There was a study to show superiority of SVC over FVC as a meaningful measure. I thought that was settled science several years ago, but they showed it again. The star of the show as far as I was concerned was a study by Plowman of a respiratory strength training program that gave people with ALS improvements. That is far more impressive than any drug therapy we've seen. At the end of the symposium, they usually have a slot for late-breaking news (and we hope something hopeful). This year it was results of the retigabine study which was not powered to show efficacy. More study needed. We first saw that as promising science four years ago. Someday I would like to see how much each study cost included in the abstracts. Some of it seems priceless, and some of it, not so much. I Heard Three Words I Thought Would Never Be Uttered By A Neuroscientist! I heard them with my own ears. 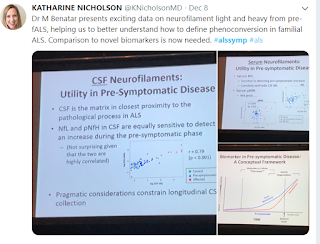 In a field where there is a lot of braggadocio from people who have only managed to deliver two meh treatments for ALS over many decades, I never thought I would hear this admission. It happened at Ask The "Experts" session (there is a whole other blog post on that title) prior to the big ALS MND Symposium in Glasgow last week. It was a refreshing dose of humility from a leader in a field where there is little of that virtue despite the terrible toll that this uncontained disease takes. Dr. Orla Hardiman from Trinity College in Dublin was speaking about clinical trial designs. 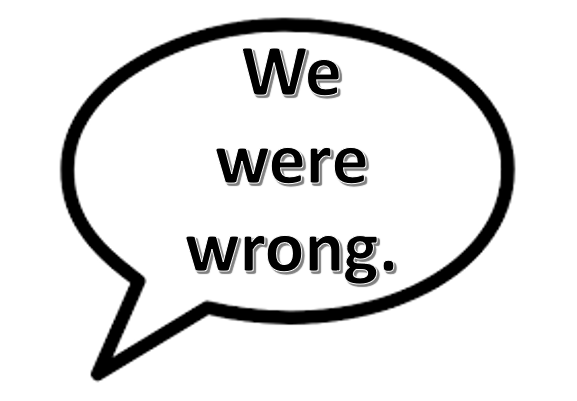 She said, "We were wrong," as she described past trial designs and changes we must make in order to move forward. That was a huge statement of fact. That admission from one neuroscientist seemed to carry forward to others during the Symposium (yet hardly stated so clearly). We look forward to some major clinical trial design changes immediately. How about some very targeted inclusion criteria complemented with EAPs that include those who don't qualify for the trials but can still provide informative data? p.s. Thanks to MND Scotland for providing all of the slides from the presenters. And next year, I hope they change the name to "Ask the Neuroscientists" and stay until every patient or caregiver question is answered. It's a busy couple of weeks for most of us. This action is important, and it requires no cooking, no shopping, and no credit card. Your current Member of Congress is still on your payroll and here is something simple, bipartisan, and immediate. Below is from Nicole and Mike Cimbura who have been working hard on this (in addition to dealing with Mike's ALS). Please read their instructions and act. Time is short. Please do it. Thank you. Reach out today via email/phone call/tweet and ask for their support as the more support equals a sooner end to this beast of a disease. Best way to make the request is to go through their health aide to ask for their support and then ask that they email Jeremy.Lippert@mail.house.gov no later than November 29th, 2018 to add their name and help to make a dent in ALS, but also others fighting a terminal disease through the Right to Try pathway. 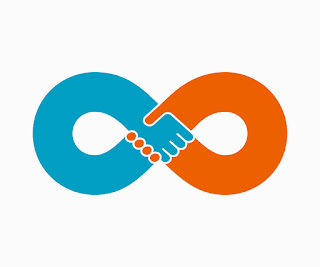 If you need to find out who your current representative is click on this link https://www.house.gov/representatives/find-your-representative Don't forget to follow up again with your Representative to see if they opted to sign on. Please share with others who are wiling to take action and come alongside the plight of pALS. Thanks for your support in making change happen and remember it always warms our hearts when you let us know it has been completed! When emailing your Representative's office paste the letters below (Rep. Coffman's information for colleagues as well as the letter for the FDA) into your email. DateScott Gottlieb, M.D.Commissioner Food and Drug AdministrationU.S. Department of Health and Human Services10903 New Hampshire AvenueSilver Spring, MD 20993 Dear Commissioner Gottlieb: We write to you on behalf of those who suffer from Amyotrophic Lateral Sclerosis (ALS) to request three simple, yet critical, actions by the Food and Drug Administration. During our service in Congress, we have had the opportunity to get to know many of our constituents, who are among the thousands in the U.S. suffering from ALS. As you know, there is no cure for ALS. There are, however, an increasing number of drugs in the developmental pipeline that provide these patients hope where none previously existed.Earlier this year the Right to Try Act was signed into law. We note that the FDA recently created an informational website about this law and has made repeated statements that it is working on providing guidance. We appreciate both; however, it is now nearly six months after the act passed, and no guidance has been promulgated. In addition, the FDA does not appear to have made any significant progress on finalizing updated guidelines for ALS drug development. This apparent lack of urgency for a disease that kills 50% of those diagnosed within 15 months baffles us and our constituents. Earlier this year, we received a letter signed by members of the ALS community outlining a range of concerns with current FDA policy as it pertains to ALS trials and patient access to treatments in the trial phase. The writers challenge the current timelines and protocols the FDA has in place that create barriers to potential treatments for ALS. 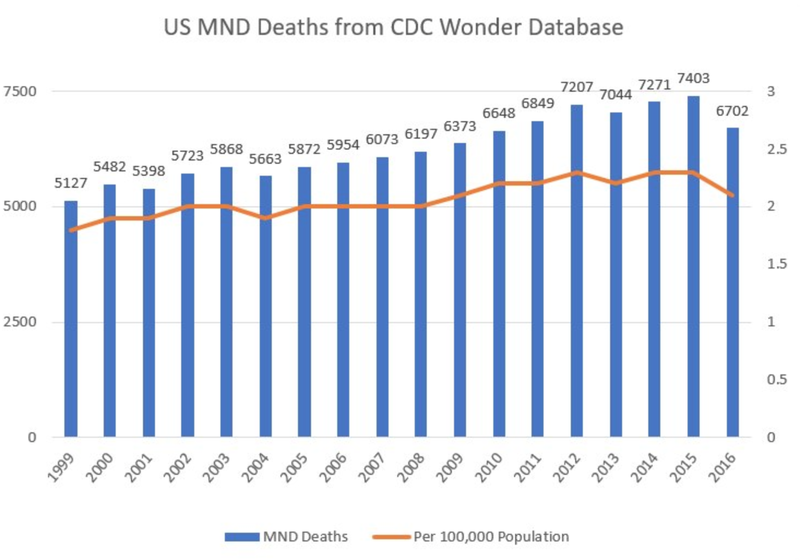 Specific concerns expressed in the letter include: the overuse of placebos, lengthy and unnecessary observation periods, and the disparity between the design of ALS clinical trials and other terminal disease drug trials. Crucially, the authors point out that, despite the enactment of the Right to Try Act, they still largely lack access to experimental drugs outside the clinical trial process through Expanded Access or Right to Try. In light of this concerning reality, we write you with three requests:1. We ask that you expeditiously finalize updated guidance for ALS drug development. It is our understanding that a draft of the guidance document was released in February 2018. Thousands of comments were submitted, and an extensive review period has already occurred. It is time to complete this document; such guidance would help industry prioritize research and streamline the drug development process for ALS. Ideally, it would be published in final form prior to the end of 2018. 2. We ask that that you expedite the creation of guidelines for drug manufacturers and physicians under the new Right to Try Act, that provide a roadmap to encourage companies to provide their experimental drugs to terminal patients. Such guidance should address concerns including the extent of documentation required from patients and physicians, and whether, or to what extent, adverse reactions to drugs under Right to Try may be considered before FDA approves a drug. 3. We ask that you appoint an FDA representative to work exclusively and directly with the ALS community and their representatives to build a strong partnership and aggressive plan to ensure our goals are met. For all three of these asks, we request that you reply with a clear timeline for completion of these initiatives, an explanation of why the proposed timeline is appropriate, and the ways in which you have incorporated patients, their feedback, and their lived experiences into the guidance that the FDA is drafting. We also ask that you provide us with the appropriate points of contact at the FDA who are leading the effort to promulgate the requested guidance. We cannot adequately stress to you the need and importance for further action in combatting ALS. This disease is torturous to those who suffer from it and a nightmare for family members who must watch their loved ones atrophy. We appreciate your prompt attention to this request and the favor of your reply by December 28, 2018. Captain Reggie Fisher knows he can. You see, he had a smart method for counting every Walleye that was really slick. He went out in three of our five Great Lakes -- Michigan, Erie, and Ontario. He caught Walleye, tagged them, and tossed them back in, over and over and over and over. He recaught some with tags and some new ones. 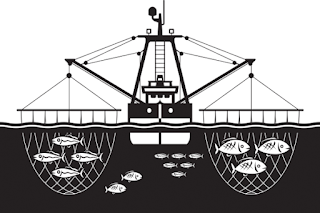 Captain R kept records and did that long enough that a model (ok, he made some assumptions and picked among models) could statistically tell us all how many Walleye are in the Great Lakes. He came up with a number that statistically tells us that there are 10,725 Walleye in all the Great Lakes. 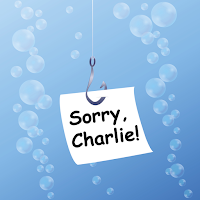 Do fish that were tagged and thrown back behave differently than the ones that escaped his nets? How do we know that his sample reflects the Walleye in Lakes Superior and Huron where he didn't go fishing? Maybe they are different because it's so much colder up there. Are there Walleye that swim deep and always escape the nets? His number seems awfully small. How do we do a common-sense check on his results? Perhaps we should measure it against some known data? This seems like a case where we need to be a little skeptical of the answer that the computer chunks out. Does it pass the common-sense test? And now Captain R says he has the technique be the definitive source of populations of every species in the Great Lakes. Silly story, you say? I wish it were. Recapture (repetitive sampling, marking, and resampling) is an established way to figure out how many beans are in the jar or how many fish are in a lake. It gets a lot more complicated when there are multiple jars and multiple lakes and diverse beans and fish. 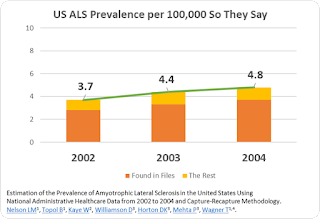 Prevalence (the number of people with ALS) per 100,000 as a rate is hard for me to picture, but something really bothers me when the prevalence rate increased 32% from 2002 to 2004. That's a lot! Would that not have caused a national ALS panic in 2004? 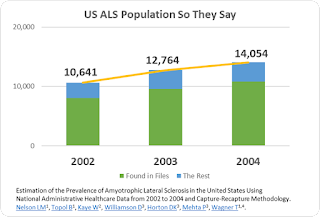 I multiplied the prevalence rate by the U.S. population and here are the total number of people with ALS they say we had in 2002, 2003, 2004. That seems small. Maybe we need to be skeptical of the answer that their computer chunked out? 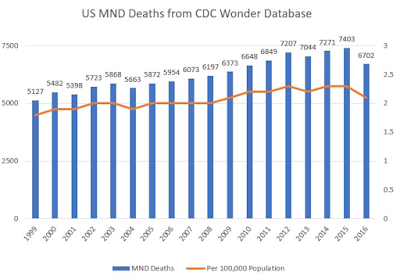 Then I pulled out the MND Death Certificate data from that we can get online in the CDC's Wonder database, and it makes those counts of people with ALS in those years really look weird. Did over half the people with ALS in 2002 die in 2002? 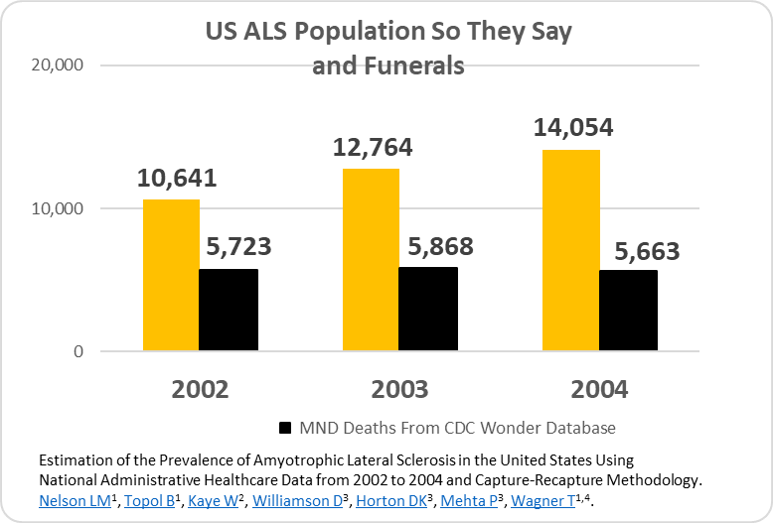 Does such a small but severely rising population of people with ALS make sense with the fairly flat death certificate data? In the recapture paper, you can see the bold pitch for being the purveyor of patient counts for all diseases based on the wonderful statistical results they got with ALS. Really? Just because the CDC published this paper doesn't mean that we shouldn't be asking questions and challenging the concept of fishing through Medicare, Medicaid, and VA files as being the end-all solution to determining patient populations. 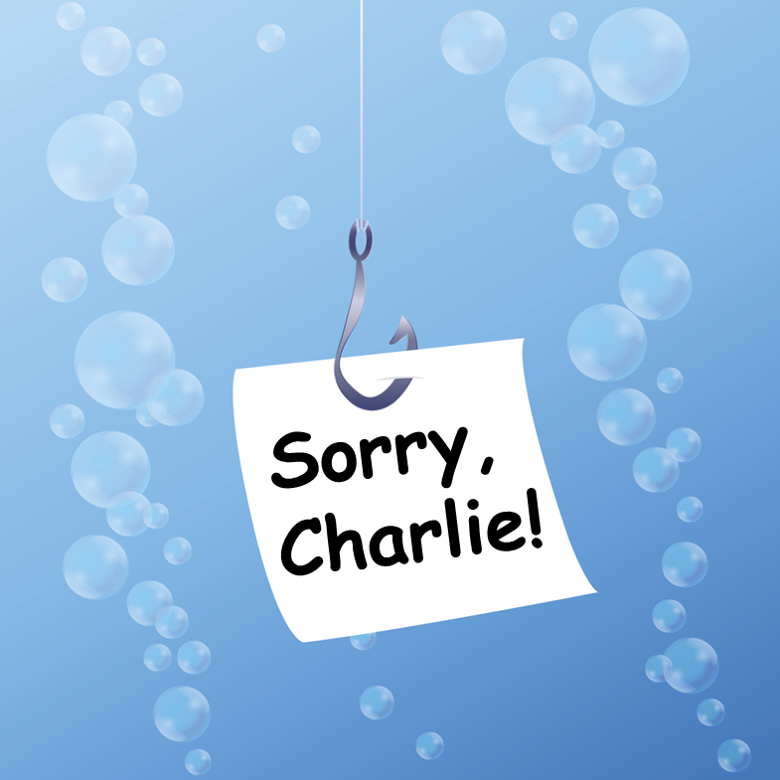 The only reason that file-fishing technique made any sense for ALS when the Registry was proposed was that people with ALS had a shortened wait for Medicare and it seemed like most would be captured there. We have found a myriad of problems in the technique in the decade since. Some people with ALS still able to work delay the Medicare decision. Some people with ALS find better coverage in private plans to which they may be entitled and never enter Medicare or Medicaid or VA. Some people with ALS opt into Medicare Advantage plans and are not included in the Medicare files. We have every right and obligation to challenge the results as not passing the common-sense test. It's interesting, sure, but is it right? And to suggest that with this, the CDC has the end-all technique that we should use for other diseases (that don't even have the possible greater populations in Medicare or VA files) is suggesting that we're pretty gullible taxpayers who are willing to settle for whatever we get. Government Project Manager to Contractor: "You're not getting the job done. We're paying you $400,000 a year and we're not getting results. Take corrective action today and report measurable improvement by the end of the quarter if you want to continue as our contractor." These words are never uttered when the Contractor is also the chief lobbying organization that gets generous funding every year for the project. And nobody sees a problem here? 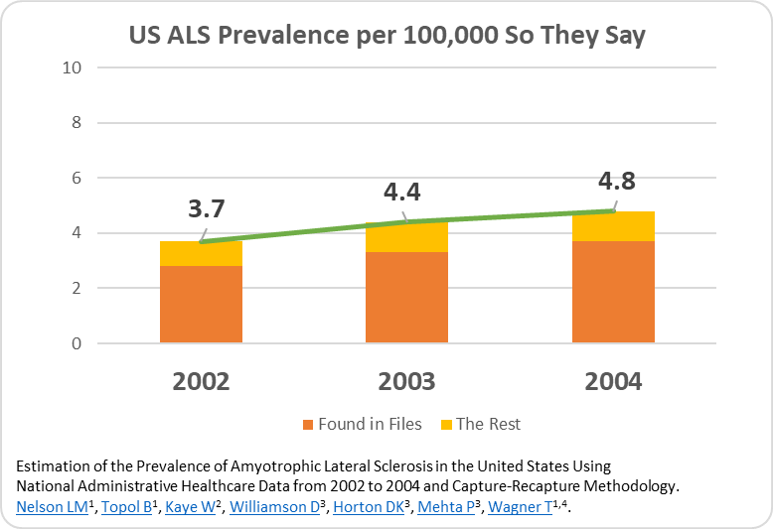 Over a decade after we helped pass the ALS Registry Act, the deliverables from the project have been poor. It makes generalizations that may contribute to implicit bias. It can't even do incidence. It has been obscenely expensive. Yet we hear how great it is. 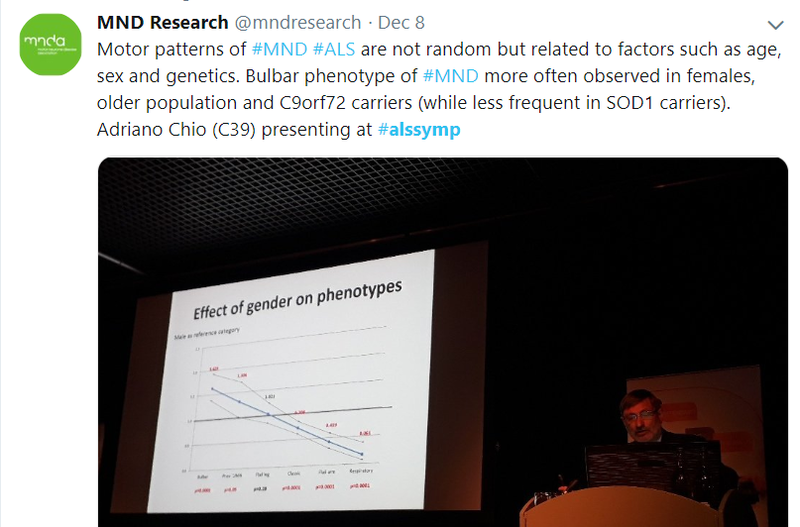 At the ALS MND International Symposium last December, the CDC Registry people presented a study they did in a general session (a big scientific stage). It measured distances of people with ALS to clinics. Certainly an interesting concept, but the ALS patient population they used was part of a Registry that pays clinic sponsors well to promote the Registry. Might they not already tend to be nearer clinics than the people the Registry missed? Might there be a basic data problem here? They presented. Applause was polite. Then a noted ALS scientist in the audience got the microphone and said, "Very nice work!" I was floored. He's smarter than that. Very nice work? Later I looked and, behold, he received grant funds from the generous CDC Registry budget. Nice work, sure. So much for peer review. Next week (August 7-8) the annual CDC Registry meeting is scheduled. It is an invitation-only affair in Atlanta with the CDC and project contractors hand picking the invitees. We don't even have information on how to watch a webstream this year. I predict that the paid facilitator will make sure that everybody there knows the procedure for expense reimbursement and will make sure people know not to beat a dead horse and keep the agenda moving. Patient representatives will wisely suggest at some point in the meeting that specific measures and goals be set for increased Registry self-enrollment, and the facilitator will never make sure we come back to that concept. Nobody will address the significant problems in this Registry bluntly. Nobody will demand to know how in the world it manages to burn through $10,000,000 per year. Nobody will talk about how misleading the data published from the Registry can be. Nobody will be honest about the value or lack thereof of the project. They'll all go home and feel good. They repeat the ritual year after year. 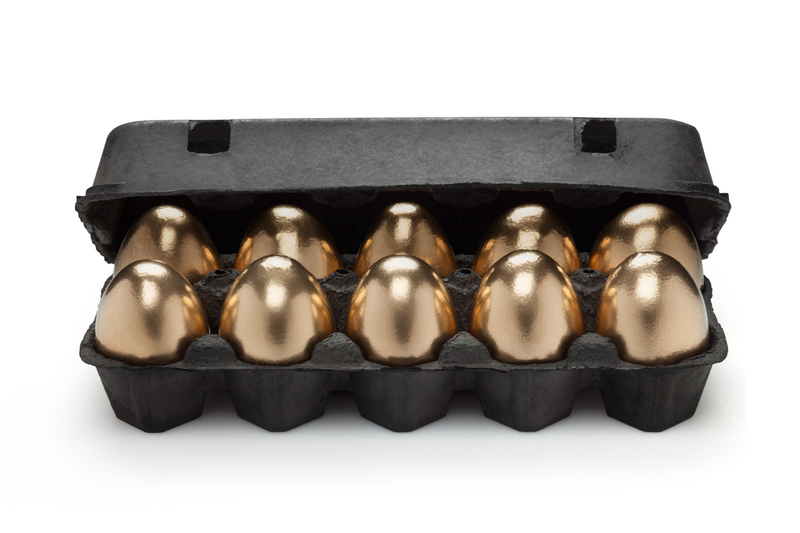 Some of those eggs are golden no-bid contracts. Some are golden research grants. Nobody at that meeting will kill that goose. Nobody will give it the scrutiny it needs. 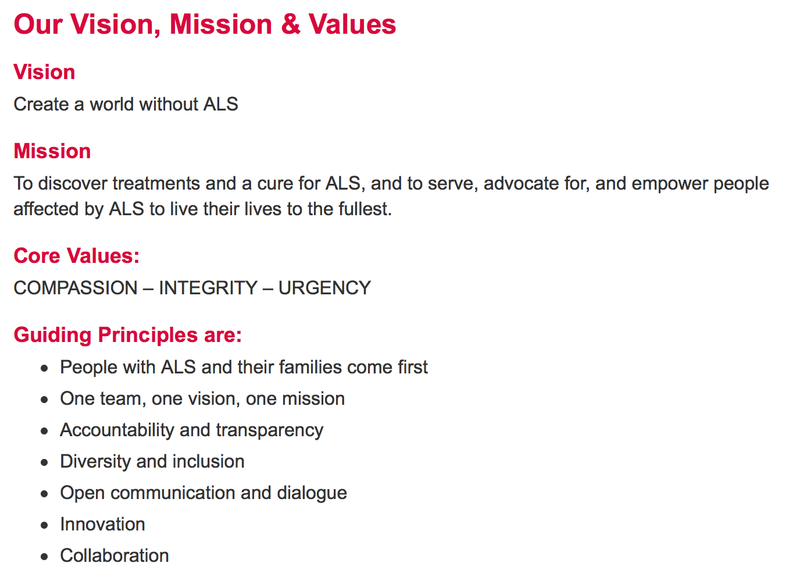 From the mission statement: "... empower people affected by ALS to live their lives to the fullest." On Thursday I attended ALSA's workshop related to the ALS FDA draft guidance document. A remote webstream was also offered. There were very specific rules for making comments at this workshop. In the days before the workshop, a man with ALS took the initiative to develop a questionnaire with some peers with ALS to provide actionable data to the workshop. It was intended to be part of the commentary to be heard by the FDA as well as others at the workshop. It could provide pertinent information from people affected by ALS to the ALS Association, clinicians, investigators, and drug developers as well as to the FDA. He had over 600 responses to his questionnaire. That is big considering he had a very short window of time to gather responses and he had absolutely no organizational support is soliciting participation. He put together the interesting results and submitted them to the assigned official comments email address in advance of the workshop. He was not available for the workshop on Thursday. He had a lumbar puncture scheduled as part of his participation in a clinical trial. At the workshop some of the emailed comments and questions were relayed to the group. Neither this questionnaire nor its informative results were even mentioned. Nobody took the time to describe it to the group. Nobody simply emailed the pdf to workshop participants. Nobody was thoughtful enough to empower a patient voice by simply reading part of his report. He was completely ignored. He was having lumbar puncture as part of his commitment to a clinical trial, for Pete's sake! To "... empower people affected by ALS to live their lives to the fullest" could be as simple as reading from a report to give a person with ALS a voice on a day when he gave himself to clinical research. Here is the report. Included are detailed results of the survey, too. 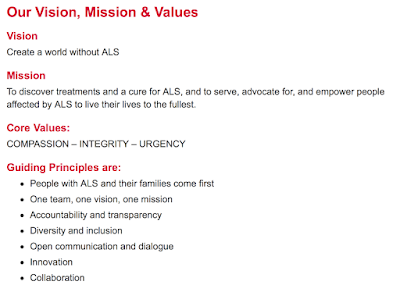 "Compassion - Integrity - Urgency"
"People with ALS and their families come first." "Empower people affected by ALS." Ignore someone with ALS who worked to contribute to the workshop. 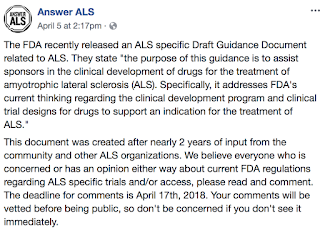 Hundreds of people with ALS and caregivers submitted comments to the FDA regarding its draft guidance for industry during the designated comments period which ended in April. Now the ALS Association is holding a "workshop" to cover the same ground, and they asked for questions and comments to be presubmitted. Below are my questions and comments for the workshop. I hope that they will be discussed openly and candidly with the FDA representatives at the workshop... and that some action will follow the lights and camera. We have seen far too many ALS clinical trials where the participants have been treated as guinea pigs rather than valuable human test pilots. Trial designs often do not provide any access to the real therapy for people who were stuck in the placebo group. They often fail to provide any continuing access to the therapy for people who tested the actual therapy and found the therapy to be helpful. The excuse we get from sponsors is cost. In my opinion, if you cannot afford to provide the real therapy to the most important people on your project team, then you cannot afford to do a clinical trial. Please, FDA, will you provide guidance that will set an expectation to include some access to therapy for all trial participants? We seem to have lost some sense of ethics in a frantic pursuit of companion biomarkers. If a trial has a washout period to see if a biomarker tracks as the patient crashes, that seems to me to be cruel. 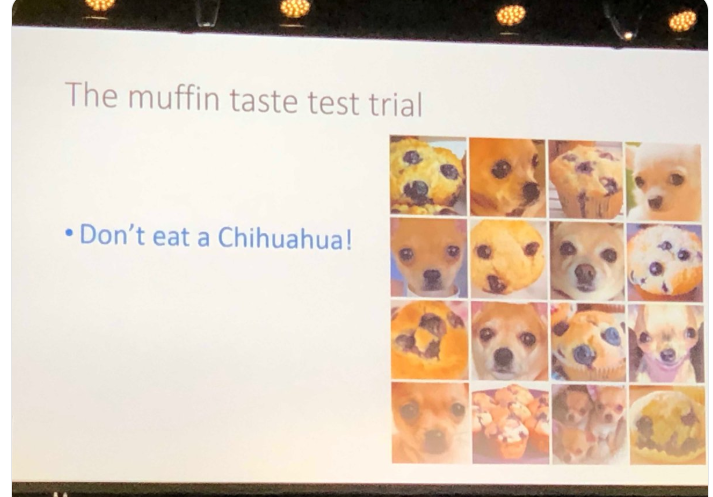 I hope that the FDA will not approve such trial designs and will say that in its guidance. Thanks to the FDA for the swift approval of Radicava. I am glad for that. As with most therapies, we know that the drug doesn't work for everybody. Since Radicava got approval for the broad ALS indication, there is absolutely no incentive for the drug company to figure out who the responders really are. If we end up with several more therapies (and I hope we do) that do something for a subset of people with ALS, we need to know more about who the responders really are. Without that, we have an expensive and time-wasting pickle for patients and payers. Will the FDA consider putting some conditions on such future approvals for post-market studies that can shed light on which patients are actually getting the results everyone desires? 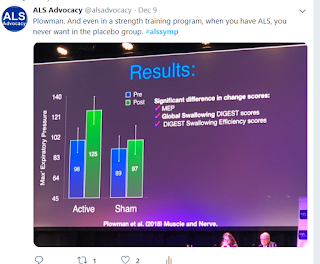 Last December at the International Symposium on ALS MND, we saw two presentations where overachieving placebo groups spoiled the results for the investigators’ therapies. There were going to be two more trial do-overs to see if the therapy was actually superior to placebo. They described the placebo groups as having done "better than expected." That's a vague reference to an historical control, folks. What you expected in the control group is based on experience and data on how ALS typically proceeds. Why not use historical controls themselves rather than kid ourselves that a placebo group is superior to historical controls? 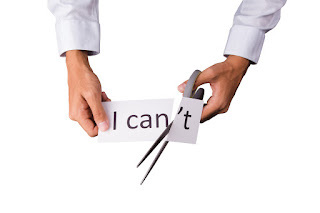 We can't afford the do-overs to get control groups in RCTs that behave "as expected." 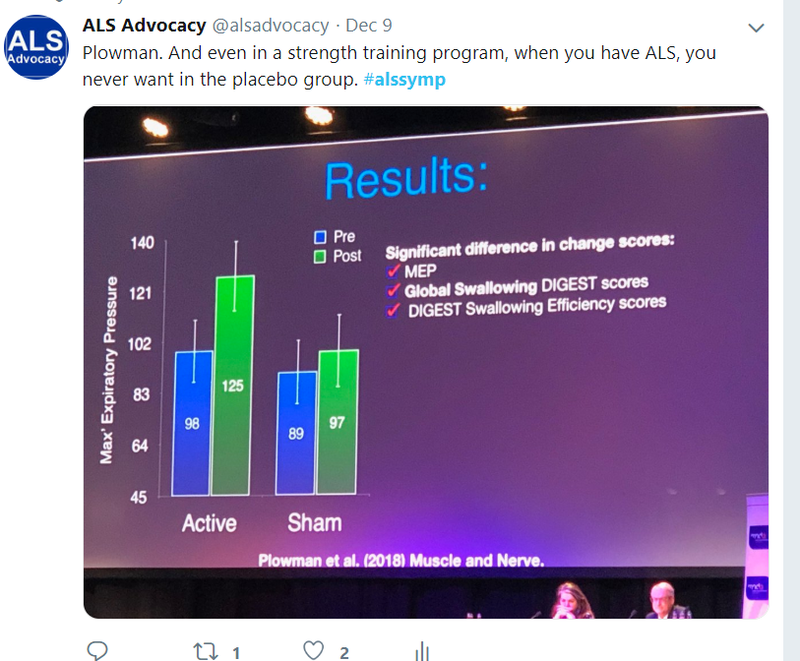 And now the recent fad of “enrichment” where trials seek fast progressors may have as much to do with finding a placebo group that declines (as expected) as it does about finding people with ALS who respond to the therapy. As the FDA issues more and more guidance documents, the problem of consistency becomes apparent to me. There is inconsistency in guidance among diseases (e.g. acknowledgment of ethical concerns about placebo in cancer trials but not in ALS). I also fear inconsistency in two pieces of guidance that a therapy developer may use for an ALS trial. One guidance may promote innovative statistical models for control groups while ALS-specific guidance may reject that. 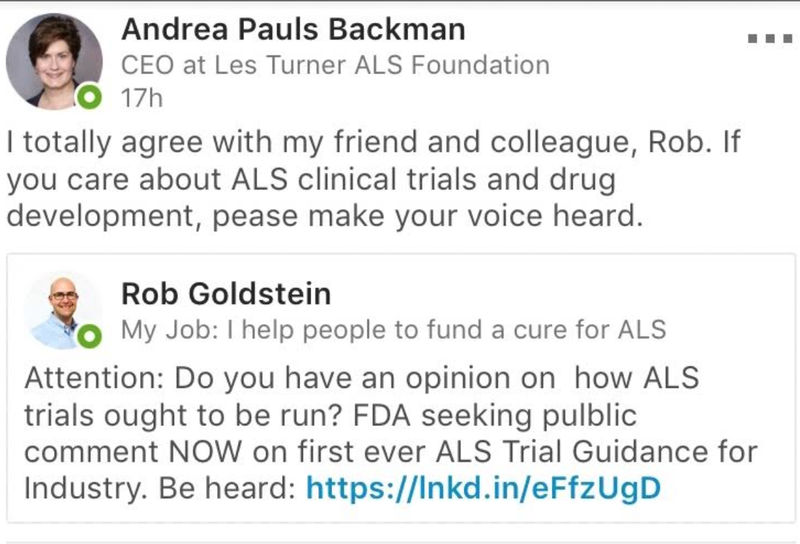 In such a case, I guarantee that a sponsor will go with the more conservative path, and a disease like ALS needs the more innovative path. At some point will the FDA review guidances for consistency and help us promote the most innovative and quickest paths to the scientific truth for ALS? 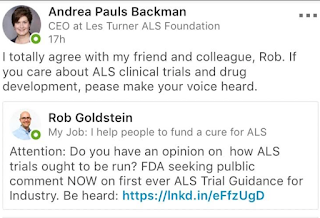 During the FDA comments period for the guidance, hundreds of people with ALS and caregivers and drug developers stepped up (frankly, without any help from the ALS Association) and made cogent comments regarding the guidance. I hope that this workshop does not diminish or distract from the comments of the many who got their homework in on time and gave their thoughts on the draft guidance at regulations.gov. The story has been repeated dozens of times. A CEO at BIO last week told of a daughter of a terminally ill woman demanding a drug for her mom under Right to Try. The picture he painted was of an uninformed, irate, unreasonable daughter. One irate daughter has become the image of terminally ill people trying to find out how Right to Try access to investigational drugs might work for them. It's an unfair and inaccurate picture. Communications-savvy companies now have a new challenge to address -- their Right to Try policies. It is not unreasonable, nor are the thousands of families dealing with ALS who simply (and urgently) need to know their options. That's a picture worth painting accurately. People with ALS hear that all the time. Here's the deal. Sign here. Clinical trials have a deal. Van purchases have a deal. Homecare companies have a deal. Power wheelchairs have a deal. Pharmacies have a deal. Hospitals have a deal. The ramp for the front door has a deal. The fundraiser even has a deal. But it's never really a deal. It's always THEIR deal. They write the rules. Their lawyers write the contracts. Take it or leave it. A person with ALS has no leverage. You sign. The patient is at the center of everything they do except the deal. Yesterday with the signing of Right to Try legislation in the US, we're entering the era of some important new deals. Who is going to look out for people with ALS in these deals? Who is going to make sure that dying people aren't handed more papers to sign that are a bad deal for them and others with ALS? Who is actually going to make clinical trial deals better so that people who volunteer for clinical research aren't forced into a pay-to-play arrangement to continue an experimental therapy? Who is going to make sure that people who got stuck with placebo in a trial are at least given a free try of the therapy as part of the trial deal without having to resort to Right to Try access? Who is going to keep Right to Try deals from imposing secrecy that will attempt to stifle patient rights to have and use and share their own data. Who is going to make sure that Right to Try deals and monetary exchanges are transparent? Patients asserted the right to try. They have a right to a say in the deal, too. Code of Conduct anyone? Now is the time. I've never understood why someone would pay to enter a corn maze. Why would you want to become totally disoriented, having to learn the hard way at each decision point, receiving no clues along the way from people who navigated before you, and never sure how or when or where you will finish? Oh, and then the next person gets to be as confused as you. Fun? Not for me. Perhaps it's because I've already done the ultimate corn maze -- ALS caregiving. Families dealing with ALS work hard and do research and discover the same things that other families discovered two years ago or two months ago or two hours ago. They waste precious time going down disorienting wrong paths. Sometimes they later find that others knew things that would have saved that them from the dead ends. And the maze gets even worse when we have multiple places to look for sometimes conflicting information. Think about a registry that notifies people that they should also register in a different registry. Last week with the passage of the federal Right to Try legislation,, a new maze was dreadfully apparent. Families were calling support organizations and drug companies and individuals, trying to find out what they might be able to try and how soon they could try it. Who knew fact from rumor? Who got a real answer from someone? You see, there is urgency here. People are dying. We need a central clearing house for objective, accurate, and timely information on the three paths that people with ALS now have to access experimental treatments, and we need it immediately. Is that drug developer currently seeking clinical trial volunteers? Will the company consider an Expanded Access Program? Will the company consider Right to Try access? Think of how efficient it would be for families dealing with ALS, support people, healthcare professionals, and therapy developers to know even these basics. Maybe start with a simple public spreadsheet. Grow to a good database as it gets traction. Add transparent information about how programs work (criteria to participate, locations, costs), and we would actually have refreshingly efficient information for people to deal with ALS and to take advantage of appropriate paths to experimental treatments. 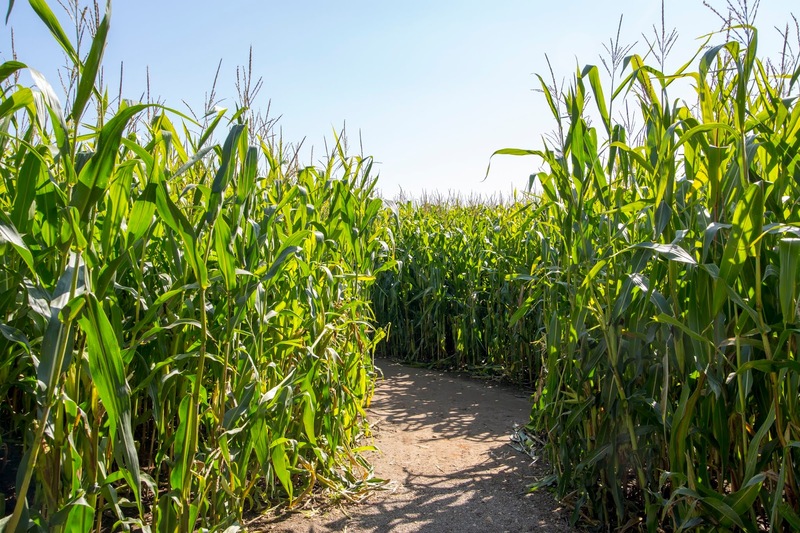 Until then, step right up to the entrance of yet another corn maze that will waste the precious time of everyone involved in a disease that makes you pay a terrible price for wasting time. The day a family member gets an ALS diagnosis, you become a passenger on a terrible, out-of-control, speeding, downhill train. It is a nightmare ride and there is little you can do to change what is happening. Somebody is in the locomotive doing ineffective things, and the whole family is stuck riding in a passenger car. "Try" is a word that has a different meaning when you are stuck in coach. It's not particularly the transitive verb that the rest of the world uses -- try escargot, try a Chevy, try a new tennis racket, try asparagus. It's simply that you want to try. You want to take a swing at life. You want to take a nasty swipe at the disease that put you on this train. You want a moment at the controls. Regardless of where you are on the Right to Try opinion spectrum, we all owe it to every family dealing with ALS to give them a better journey. Yesterday there was pandemonium with families trying to decipher what concrete options may have opened up to them. They don't need more pandemonium. They need help. ALS advocates and advocacy organizations owe them that help. This isn't a moment for "I told you so." This isn't a moment to conveniently hide behind agnosticism. This is a moment when families need organized information on all options (including candid policies from drug developers). This is a moment when we can encourage people with ALS to openly share data about whatever paths they find and take. This is a moment when we can fix the problems of trial and access processes that we didn't deal with for years. 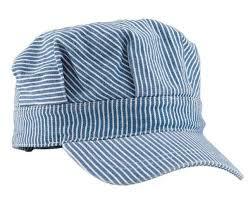 People with ALS and their families deserve a fighting moment in that locomotive. It has burned through $78,000,000. Do we really want to spend another $10,000,000 on this? "Every 90 Minutes" has been a tagline that organizations have used for over a decade to describe how often someone dies from ALS in the US. The number has been steadily increasing. Based on an average of 7000 ALS deaths per year in the US in recent years, the tagline is missing 3 American funerals every day. 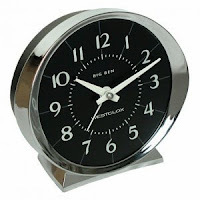 It's every 75 minutes, and that number is quickly approaching one funeral per hour. The tagline should be "Every 75 Minutes and Not Getting Any Better." 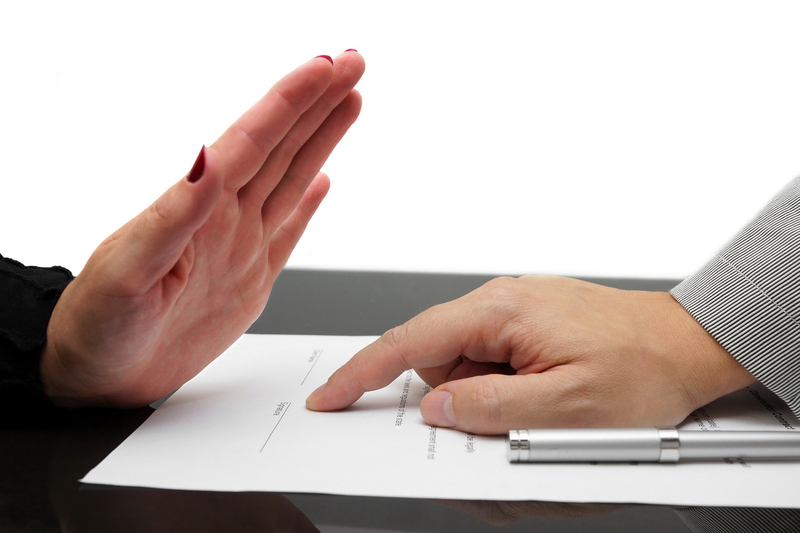 Do You Really Want To Be A Silent Partner In This? 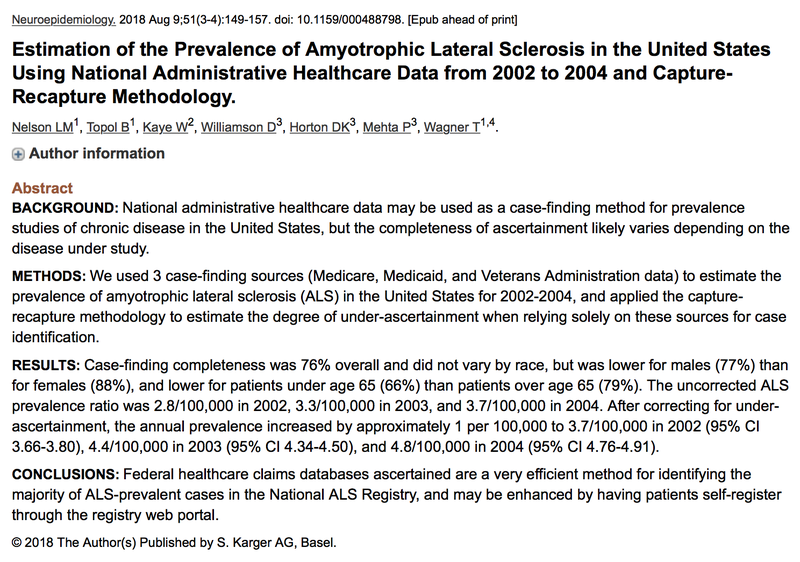 Words of concern have clouded the CDC ALS Registry for a decade -- disappointing, incomplete, expensive, opaque. The concerns have never been enough to be faced seriously by those who set funding priorities. The project gets a generous annual autopay of $10,000,000 that is a recurring top ALS Association priority. 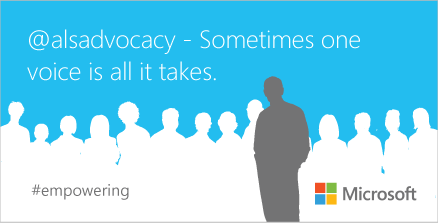 Hundreds of sincere advocates just do what they're told every year and support what must be a noble goal. The project has now crossed a line that demands action. The goal may be noble, but the deliverable is doing harm. Yes, it is doing harm. 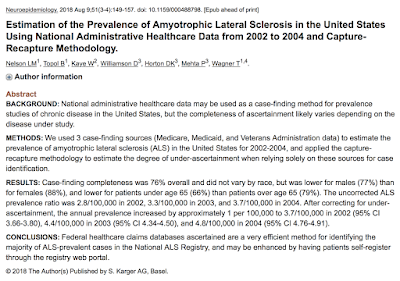 In October a report was quietly published that confirmed and quantified the completeness problem, and it showed data that should concern (if not outrage) every ALS advocate. Please read it. 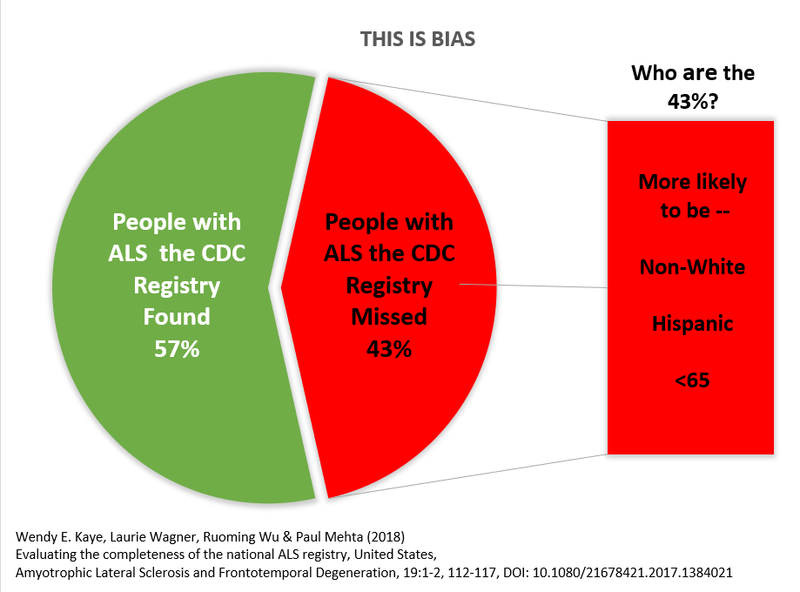 The CDC Registry missed almost as many people with ALS as it found, and the people it missed don't exactly look like the people it counted. Bias (implicit or explicit) is a big issue in clinical research, and this Registry is a source of bias. 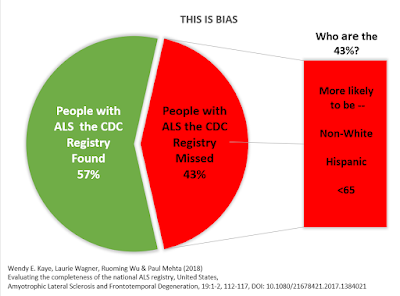 CDC annual reports on ALS assert general disease demographics based on the people with ALS they found, not on the missing 43%. Think about that. In a poorly diagnosed disease, this can even be self-fulfilling. CDC clinical research notification goes to the people with ALS they found, not the overlooked 43%. So much for diversity in clinical trials. Do you want to be a party to this? Will we all look back in a decade and cringe at what this generous funding was enabling? First, do no harm. This Registry is doing harm. Do you want to be a silent partner in this? Please speak up. This issue matters. The 43% matter. "Y'all Take Care Of It Yourselves"
"We don't have anything to say right now." That's the mystifying strategy that a gaggle of large ALS organizations have taken during the most important ALS public policy crisis in decades. 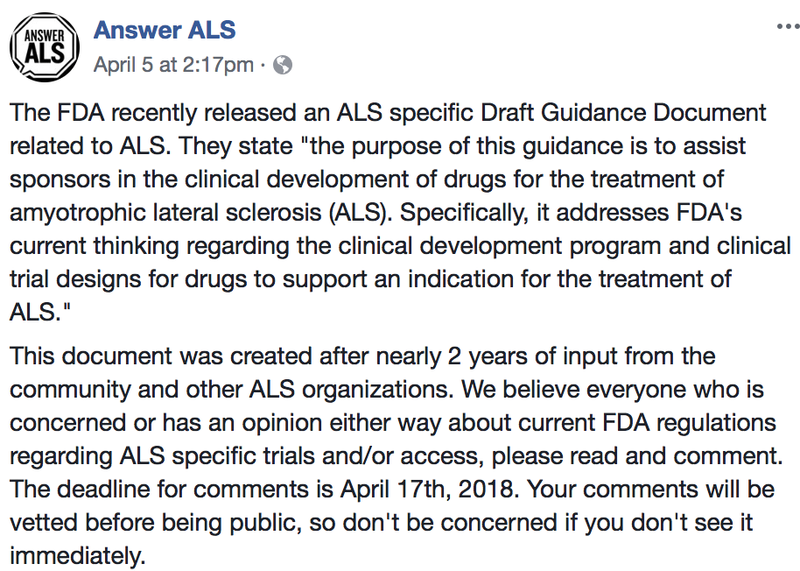 We're in the final week of the comments period on the FDA ALS Draft Guidance. 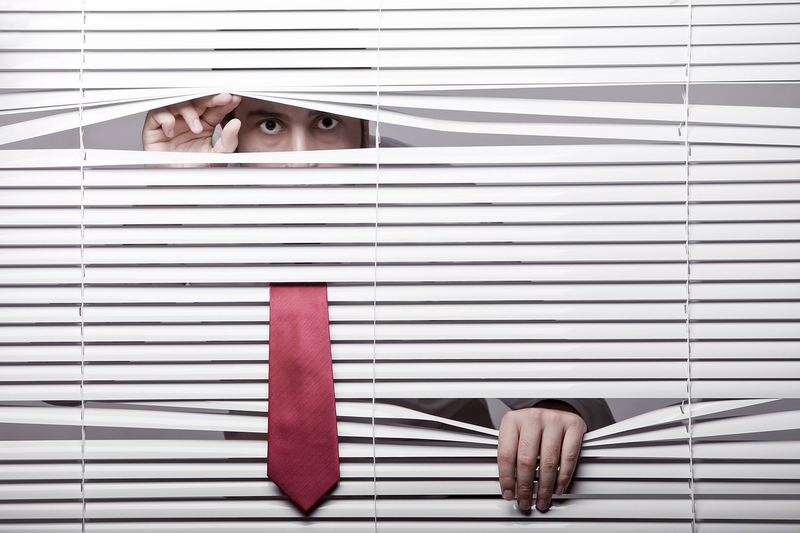 So far organizations have gone into hiding and engaged in an odd abdication of leadership, telling individuals that it's up to us. They are urging us to submit comments but have not issued any comments themselves. Keep in mind that this guidance will directly affect clinical trial designs moving forward, and the draft guidance we got does not encourage innovation in trial designs. If made final, this guidance will in no way speed up drug development or approvals. But our largest ALS patient advocacy and research organizations have no official comments. They turn to us individuals and say, "Y'all take care of it yourselves." 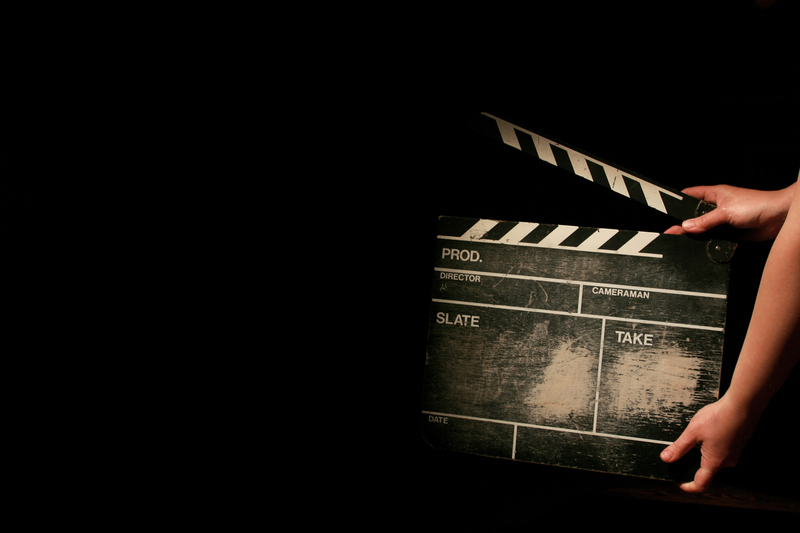 Guest Blogger: It's Crunch Time. Take Your Shot! It's crunch time for comments on the FDA ALS Guidance. Time's almost up Here are thoughts generously provided by a knowledgeable and relentless ALS advocate. Please read and take your shot! Hey. Back to the “Considerations Regarding Food & Drug Administration Review and Regulation of Drugs for the Treatment of Amyotrophic Lateral Sclerosis”. We need help. It would be fantastic if we had an advocacy group taking the lead here but alas…. let’s move on. When it comes to drug/ therapy development we are failing. We have two approved drugs to “treat” ALS. One “may” extend life 3 months. One “may” slow down progression (while fleecing everyone involved). There is no question – ALS is a difficult disease to target. However, we are failing before we begin. We are currently using archaic protocols in drug development. The measure of success will never be met because we are using a yardstick that does not correspond to the disease. If we are ever going to make a dent in the utter havoc this disease wreaks on everyone it touches, we MUST change the way we approach it. 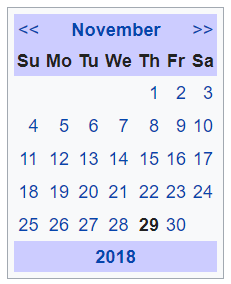 We have one month left to make comments. PLEASE comment on the guidance for industry the FDA has proposed. I am including some suggestions below to get your thoughts rolling. Feel free to cut and paste any combination, should you agree with them. I am also including some complete comments. Change them up, use completely different ones. use them exactly. Whatever works for you. PLEASE speak up, share your thoughts, be heard. The FDA must encourage innovative clinical trial designs tailored to the population living with the disease and reflective of the heterogeneous nature of its presentation. This disease demands urgency. Use clinical trial designs which reflect the same. Push for the use of trial designs that realistically represent the number of people living with this disease at one time. Push for mobile travel sites in to allow a larger number of participants. Push for remote data collection to make it easier on families to participate. Use historical controls from the PROACT data base vs. placebos. Choose an endpoint other than death... a predesignated drop in FVC or specific point loss of ALSFRS. Consider taking guidance from people living with this disease. Please do not accept this guidance as is or we will be having the same conversation in another 50 years. This guidance does not reflect the advances in technology, science, or data collection we have made this last century. We must encourage the industry to embrace innovate trial design that correlates to the number of people living with the disease at a given time. Use historical data, mobile trial sites and remote data collection. Change eligibility criteria so more people can participate without compromising quality of life interventions that currently exist like the feeding tube which allows people to maintain hydration and minimize the thickening of secretions. We already ask too much of these families - do NOT ask them to give up the few things we can offer. This proposed guidance will do nothing to accelerate the development of viable therapies to treat ALS. The status quo is NOT working and this guidance IS the status quo. We need the FDA to encourage and support innovative trial designs that make sense with a rare and terminal disease with rapid progression. Widen the base of participant eligibility, use mobile trial sites and remote data collection to include people who do not live near trial sites. Use historical controls. encourage accelerated approval. We must change the way this disease is approached because what we have done the past 50 years, what we are doing RIGHT NOW, is not working. The guidance presented is antiquated, out of date, and demonstrates zero use of updated technology and data collection methods. This is a rare and fatal disease with no significant therapy. Trials used in drug development must reflect the number of people living with this disease at one time - the duration of the disease - the wide geographic locale of those diagnosed. There should be mobile trial sites and remote data collection, the use of historical data vs. placebo arms, eligibility criteria reflective of a savagely progressive disease. Please do not allow this blatant disrespect and disservice to the people from whom we already ask too much. This site provides news updates, comments, and ideas related to ALS advocacy and awareness-building. Comments are moderated and are also welcomed. This site is provided privately and is not part of any ALS 501(c)3 organization. We encourage your support of those charities. I neither seek nor receive any compensation for my work to improve the fight against ALS. The cause is a mystery. There is no cure. People with ALS - You count. 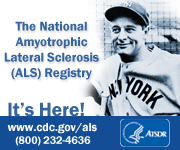 Please be sure you are counted in the CDC's National ALS Registry!